With summers fast approaching, ceiling fans are one of the most inexpensive ways to keep the house cool especially if you live in hot and humid areas like Delhi etc. Not only are they available for about Rs. 1000-2000 but consume little energy and even work well in tandem with air conditioners too. Brands like Gorilla, Crompton to even Havells have come up with all sorts of designs and technology to woo users. So the question remains, how do find the best ceiling fan in India? Luckily for you, we did all the digging and this buyer’s guide covers everything you need to know to get a ceiling fan that is efficient, effective and fits your budget. 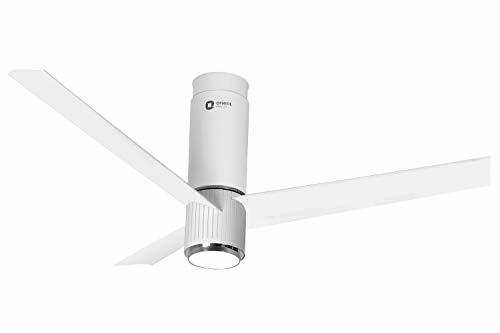 Orient Electric Aeroslim: If you have the budget, the Orient Aeroslim is one of the smartest ceiling fans you will come across in the India market. From pairing with Alexa to your smartphone and a sweeping range of 1200mm, this ceiling fan is more than what you would have asked for (its build to last and impress). Orient Electric Apex: On a tight budget? No problem. Orient has the perfect combination of performance, durability and low cost with its Apex ceiling fan. The 1200mm sweeping range makes it ideal for most houses while the double ball bearing ensures low noise at even the fastest speeds. Wondering why you should be paying about 7k for a damn ceiling fan? The Aeroslim have been revolutionizing the way we handle ceiling fans and here is how (you will not regret this buy). The Aeroslim easily pairs with Alexa or even Google Assistant and trust me, controlling a ceiling fan does not get anymore hands-free (no regulators or remote, this is the 21st-century baby). And we are just getting started. Pairing it with your smartphone app gives you tons of functions like fan scheduling, sleep mode, timer, breeze mode, and turbo mode so you get just the right amount of breeze in the room. It is also equipped with the reverse function which comes in handy during winters. The reverse direction lifts up the cold air and pushes down the warm air to keep you cozy all through the night. The under light can also be dimmed using your smartphone so you always have ample light whether it is the kitchen, bedroom or even the living room. Making it ideal for all-around home usage is the 1200mm sweeping range. The 240CMM air delivery rate and a peak speed of 310RPM ensure ample air and speed are generated to reach all parts of a room and fulfilling that with utmost precision are the aerodynamically designed blades. Also, these blades are built using high-grade polymer and are 100% rust-free so you know you are making an investment for the future. The telescoping adjustable mount means whether you have a false ceiling or a slight slope, the fan can be placed at an appropriate height without having to spend extra on rods. So with all that speed and features the fan is sure to pinch your pocket with high electricity bills, right? Absolutely not, with an inverter motor, at 45W this ceiling fan consumes less electricity than most standard ceiling fans that stand at about 70-80W. Plus, it also operates at a lower noise irrespective of the speed the fan is being used at. Well, who knew you could even show off your ceiling fan nowadays 😉 . Repairs of the fan are going to be costly and neither can be done by ordinary electricians. Though thankfully it has a long warranty and is built keeping in mind durability so should have no issues for years to come. Also, it will cost you the big bucks it is priced around 7k. It comes with features like Sleep Mode, Turbo Mode, Timer etc. If you have the taste for the fancy, this fan is tailor-made for your home. Unparalleled features will make using the fun both fun and convenient and thus it is worth every rupee spent. 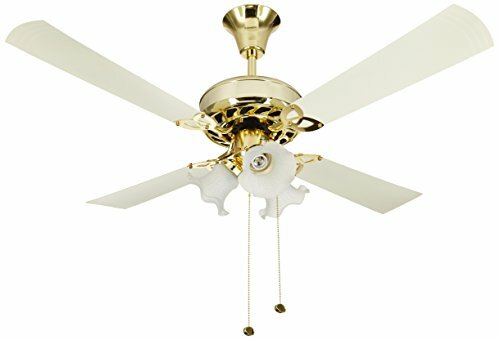 Not your average ceiling fan, this model by Crompton is the epitome of style and utility and sure to grab every visitor’s attention is a flash. More about this peach below. ‘Wow, that is an awesome looking fan’. With the Crompton Uranus fan, compliments like those are going to become an everyday affair. After all, the Gold Finish design adds elegance and a touch of bling to your rooms uplifting the overall look and ambiance of the room (everyone’s going to want a second look at it, no doubt). But isn’t just looks you would be paying for. The fan has a sweeping range of 1200mm which makes it ideal for even large living or dining rooms. Plus, the fan has 4 blades. This not only keeps noise at minimal even when operating at full speeds but also ensures even spread of air to every corner of the room. So even the farthest seated guest can enjoy the cool breeze. Adding to the utility of the fan are the 3 light shades (be it summer or winters, the fan will be an eye-grabbing feature of your house). The lights can be controlled via separate cords. The metallic build of the rod and blades gives it excellent durability and strength ensuring the utmost safety of the guests and family members seated below. Lastly, with 72W power consumption, the fan is quite energy efficient which means it has little impact on the electricity bills even when run all throughout the day (summers are about to get less sweaty). On the downsides, the ceiling fan does not come with a remote control which would have proved to be the icing on the cake. Also, due to the light shades, the fan does accumulate dust and dirt and thus needs regular cleaning to keep the bling. It is one of the most expensive ceiling fans on the list. It has a sweeping range of 1200mm which makes it a great fit for rooms of about 130sq. ft. 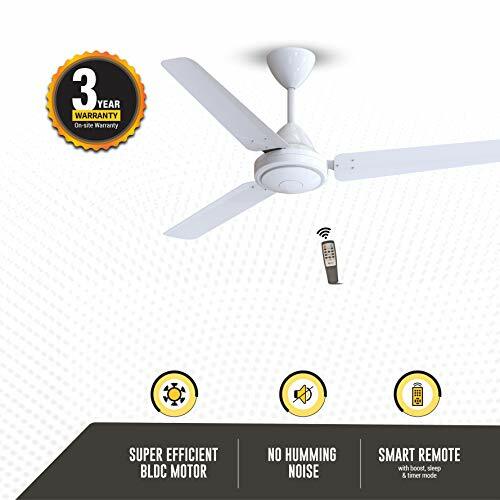 If energy efficiency was utmost priority for you, this Gorilla Efficio ceiling fan is just what the doctor ordered for and here’s why. Wondering why we are stressing so much on its energy efficiency? Because even at its highest speed the fan consumes a mere 28W of power (yup, you heard that right) making it the most energy efficient fan on the list. But don’t just take our word for it. The fan also has a 5-star BEE Rated BLDC Motor. Plus, the motor also delivers longevity and a low noise performance ensuring you get your money’s worth. Another awesome benefit of this brushless motor is that it consumes little inverter battery so you can continue to enjoy the cool air for long hours even during power cut-offs (say goodbye to sleepless sweaty summer nights). But that is not all. Thanks to this advanced motor the fan is also equipped with features like Sleep Mode, Timer and even a boost mood for the really hot days. Think using a fan hardly get any easier right? Guess what, it does as all these features can be adjusted using a remote control. This means you can now adjust the speed or timer without having to get off the couch or bed (just what the lazy you and I needed to hear). The aluminum build of the blades and rods ensures long-lasting usage as they are rust-free and thus also easy to maintain and clean before the big festivals and family gatherings. The fan’s sweeping range is similar to that of the Crompton i.e. 1200mm so whether you have a 130-140sq. ft. drawing room or bedroom, the fan’s breeze reaches all parts perfectly well. One of the few drawbacks of the fan is the white color. While it perfectly blends in with any home interior, dust and dirt are quite evident and thus needs regular cleaning. Also, the remote is of cheap plastic so you will want to use it with care. Are you looking for a ceiling fan on a budget? At less than Rs. 1500, this Orient Fan is pretty much everything you could have asked for and here’s why. One of the best features here is that even for a cheaper fan the Orient does not compromise with quality as it is evident from the copper motor the fan is equipped with. Not only will the motor give you uninterrupted cool air for many a summer seasons but it will also do so without disturbing your sleep as it creates little noise when at top speed. This is further ensured by the double ball bearing (just in case you still had doubts). And that remains true even when running on inverter as it consumes little battery and does not lower performance. Also, the motor is capable of delivering air at 200 cubic meters per minute at a speed of 360rpm with a sweeping range of 1200mm. So what does this mean? In simple words, whether you have a huge dining hall, living room or a bedroom, no person will be sweating their pants off. Why? That is because all of these features ensure the 3 blades distribute air well to every nook and cranny of the room and combines well with an AC too. The aluminum blades are rust-protected and thus built to last. They can be cleaned with a damp cloth when need be. And if you are worried about regular maintenance with a white fan, you can also opt for the brown color. This also gives you the power to choose a fan that best matches your home’s interior. Lastly, while energy consumption of the motor is a little higher at 78W, it is lesser when compared to other cheaper ceiling fans and thus is light on the pocket in more ways than one ;). In order to cut the cost down, Orient does not provide you with a regulator with the purchase. Also, the rod is a tad smaller than I would have preferred and a larger rod costs extra money. Not the fanciest of fans as it does not have remote or even free regulators but for budget buyers looking for a ceiling fan for larger rooms, this is hands down the best ceiling fan in India. You probably do not think you need a buyer’s guide for a ceiling fan, right? After all, how tough can buying a ceiling fan be? Well, that is where you can go wrong as you may often miss out on the latest features and designs. So here are few tips to keep in mind when looking for the best ceiling fan in 2019. The first and foremost thing is to choose a fan as per your room size and this factor is determined by the sweeping range of the fan. This range can vary from 600mm to as high as 1400mm but 1200mm is the most common range and is ideal for any standard apartment. In case you have an even larger area to cover I would recommend going with 2-3 1200mm fans rather than one 1400 fan since that will support better air delivery and distribution. Have you ever wondered why most ceiling fan blades come with a tilt or angle? That is because a straight blade would cut right through the air rather than spreading it throughout the room. Also, it will wobble and make the fan really noisy. A blade with a pitch of about 10-12-degrees is ideal. But as the pitch gets steeper i.e. about 14-degrees or higher, it will need a more powerful motor to operate at a higher speed. A low-powered motor will wear out the blades quickly and the blades will again have an uneven distribution. Bottom line, the motor and the blade pitch need to be in sync with one another for optimal performance. BEE or Bureau of Energy Efficiency rating defines the energy efficiency of any appliance and is an important buying factor especially in Air Conditioners in India. In the case of ceiling fans, this rating is only provided for fans with a sweeping range of 1200mm or higher. Any fan with a power consumption of 80W or more can be termed as inefficient whereas if you would like to save about Rs. 1000-2000 every year on the electricity bill, a fan with a power consumption of 50 or less should be just perfect. Irrespective of what you buy, your budget can often make or break your buying decision and this is why it important to sort out your budget and needs in advance. While most standard ceiling fans can cost you in the range of Rs. 1000-2000 the higher-end models like those with remote controls, light shades, BLDC motors etc. have a hefty price tag of about Rs. 2000-4000. But keep in mind, these fans also tend to be silent, more durable and convenient to use. Simply put, the more the benefits, the higher is the cost. Like the angle, even the number of blades in a fan make a difference. Traditionally, fans come with 3 blades but you can also find 2 or 4 blade fans. So is 4 blades better than 3? Or do you need a 2 blade fan? On a general scale, a 3 blade fan usually has a right balance between speed and effectiveness and while 4 blades offer better air distribution and effectiveness, they are usually slower. In the end, the choice comes down to the room size and the distance at which the people would be seated from the fan. As a safety precaution since you most likely have kids at home, I would recommend installing the fan on a flat roof at a height higher than 6-feet above floor level. Yup, if you have false ceilings around the house you have lesser room to work with but having the right amount of gap should be a priority even it means using a slightly shorter rod. While false ceiling may call for smaller rods slopped roofs require longer rods so that fan is low enough to keep every part of the room cool but do not forget to maintain the right amount of distance from the floor as well. Some of the best-designed fans come with light shades attached to the center of the fan that adds to the overall décor and utility of the fan itself and can really amp up the mood when called upon. The lights are separately controlled via cords or remotes. But in keep in mind that these fans often consume a higher amount of electricity and the light shades also need to be cleaned regularly so they continue to shine brightly. The remote control is as I would put it, a blessing in disguise. After all, with a remote gone are the days when you would have to get up every time you wanted to slow down the fan or increase the speed especially in the middle of the night. Just the press of a button and voila just like in the case of an AC. BLDC motors are the latest ceiling fan technology and the reason they are so popular as they make the fans highly energy efficient. (about 60%-70% more efficient). Plus, it also makes the fans remote controllable along with other fancy frills like a sleep mode, timer etc. You will also find that fans with these motors are less noisy. These bearings are important especially in fans without a BLDC motor because they help reduce the noise when the fans rotate at higher speeds. Which Brand is best for ceiling fans in India? Here are the top 10 ceiling fan brands in India for 2019 based on user reviews and ratings. Well, buying a ceiling is not as easy as it once was. As you already know, from the angle of the blade to the remote, light etc. fans are just not ordinary anymore and we are sure this buyer’s guide will go a long way in helping you make the right buying decision. If you have used a ceiling fan before that you are happy with do write to us about it and we would be happy to feature it in our reviews.